I wake up most mornings and think about riding my bike, which is perhaps not unusual to regular readers of this blog but may need explaining to people who thought this was going to be about party catering and are here by mistake. I cycle because I love it – a bicycle can turn an everyday journey into an adventure, a chore into an encounter with nature and an opportunity to create special memories with people I love. It improves my health and wellbeing, maintains my cake-based lifestyle and generates a sense of strength and resilience by challenging what I think I’m capable of. Unfortunately, with no ‘daily commute’ my working day contains no cycling unless I introduce it – the school run is barely a walk, the shops are on our doorstep and I can almost roll out of bed onto the train platform. Enter an entity that I had almost forsaken with parenthood – leisure cycling. Obviously, by its nature, one needs ‘leisure’ to accommodate it and this has been in short supply; a couple of years ago I could count the time I had ‘to myself’ in a few minutes a day, mainly the exhausted ones between finishing the washing up and getting into bed. This was an improvement on previous years, when I counted doing the washing up as time to myself. Then we entered this glorious phase, where our son doesn’t need constant supervision, entertainment or containment. He can be left unattended for minutes at a time and not cause harm to himself or others. I can’t really leave the country for weeks on end, but with a husband and child happy in the garden I can take my bike out for a couple of hours and not feel too negligent as a wife and mother. Perhaps having so much potential time went to my head, or the lack of an election made me feel I wasn’t quite stressed enough, but I managed to come out of a conversation with a friend this time last year agreeing that a ‘5000 mile target’ might just be The Thing to focus on for 2018. This random agreement has propelled me to cycle through rain and snow, wind and sunshine, at home and abroad. Despite the newly acquired leisure, finding the 527 hours has been more of a challenge than the 5000 miles; I’ve squeezed miles into the days by starting early and pedalling late, missing meals and some bedtime stories, riding into the night after the working day and ignoring housework, homework and volunteer work at the weekend. I’ve cycled my 30 mile non-commute from Edinburgh 34 times this year, feeling epic every time I’ve done it. I’ve seen my son’s self-esteem flourish as he pedalled 70 miles over five days in Orkney and enjoyed feeling my own strength and stamina grow as I cycled over 100 miles each week. Escaping my laptop for a lunchtime spin added many miles to my total and unexpected joy into ordinary days. As winter approached, my weekday workload grew heavy and the days darkened but Edinburgh Night Ride lit up the weekends with new routes and roads around East Lothian. I’ve loved my solitary miles too, as time to think and sometimes not to as well. I’ve had my breath taken away by the beauty of our country, and felt my heart leap with every encounter with deer, bats, pheasants, hares and hawks. Whilst there has been an endless stream of the best of miles, there have been no worst of miles. Even the frightening ones held some enjoyment. Later, when I’d got home. My 5027 mile of the year was cycled in Denmark, on the cycle paths, roads and woods of my husband’s home town, which seemed a fitting end to my year of cycling (sort of) Danishly. I’ve nurtured a plan to live in Venice since I first visited over a decade ago, falling in love with the light, the lagoon and the language. I was entranced by the way the water defined everything, the ease of movement provided by boats and the simply delightful absence of cars. Venetian friends provided a glimpse into the hidden corners of life away from the tourist masses, giving my first couple of visits that insider enjoyment of feeling different to the madding crowd moving in a tide between St Marks Square and the Rialto. I’d delayed my return to Venice until my son could reliably walk without moaning every 20m as walking is the main mode of transport for everyone that doesn’t have their own boat. If you have working feet, legs and eyes, and the energy to use them, then Venice is a highly walkable city. Although the tourist hoards have increased in the last decade and ramps are now covering several of the larger bridges, Venice is still notoriously car free and hard for anyone to navigate on wheels. Cycling is on the list of prohibitions, and the only cyclists I saw were children balance biking up Via Garibaldi with enthusiasm. It’s one of the few cities I haven’t felt the need to clutch the hand of my child and shout ‘watch the road!’ in ever more frantic volumes. Boats provide the only sound of motors, and the city’s conspicuous consumption a living daily proof that you don’t need to park a van directly outside a shop to deliver goods. But Venice isn’t just Venice. There are over 100 islands in the Venetian Lagoon and access to many of them is easy by vaporetto. Frustrated by the tourist crowds and needing to give my husband a quality day with ‘the art’, my six-year old and I headed to nearby Lido, where we knew there were cars, in search of adventure on two wheels. Off the boat and with bike hire easily arranged, we were off. Only of course we weren’t because I needed to look at a map, check Google Maps five times, go the wrong way for a while, push the bikes across the road and then check the map again. Then we were off, heading towards the beach road in an attempt to find lunch that we didn’t need to re-mortgage our house to buy. 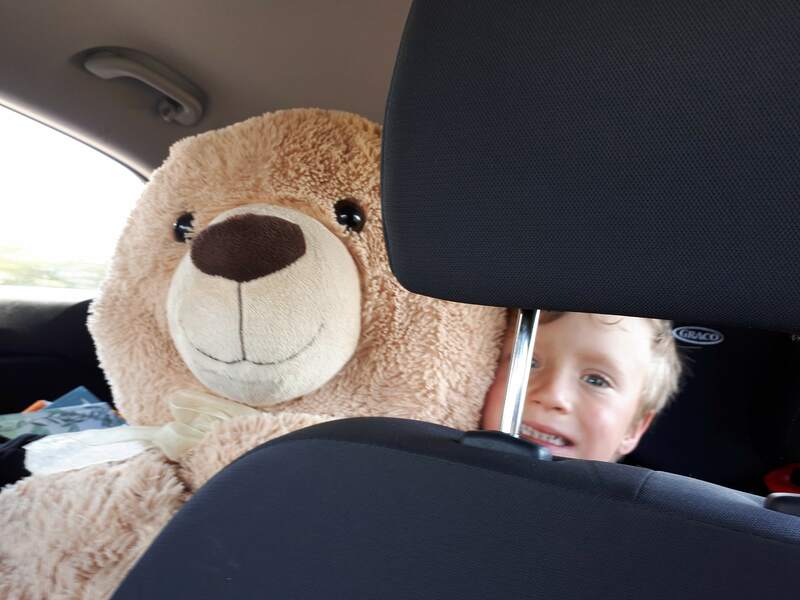 We cruised along the wide road, alternating between the familiar tension of adventure and terror as the small number of cars on the road passed rather to close to my son for my comfort. We eventually found an off road path beside the beach and enjoyed a few miles off the beaten track until hunger took us back to civilisation. We consumed the cheapest lunch available in a 20 miles radius before we pedalled off to see what the main island road held for an anxious mother and her pint-sized explorer. There was an on road separated cycle path. It wasn’t wide, but it was several miles long and had side road priority as far as I could make out. It eventually turned into a shared use pavement and then disappeared altogether just as you needed it to guide you safely into town. But still, little Lido di Venezia has managed what some cities don’t dare to dream of – safe, separated space along its main transport corridor. And, in these times of Brexit, climate chaos and Donald Trump, that somehow gave me hope that the future isn’t so bleak for our self-destructive species. When the text came – “Car Forup didn’t make it” – it wasn’t a shock. Our ageing Honda Civic had been threatening to die for half a decade and with every surprisingly passed MOT, our mechanic had smiled and muttered mysteriously “aye, well, its a Civic”. But not this time. Our reliable motor finally steered into the great car park in the sky last summer and wasn’t replaced. It seems to be an expectation that when you have a child and/or you live outside a city you must be in need of a car but we found that wasn’t true for us, and this post reflects our first year of living carlessly.. Location, location location – part 1: do I *really* want it? We live on a small town high street, with just a 5 minute walk between the train station, greengrocers and Co-op. The ‘weekly shop’ isn’t a thing for us, with most weekday meals planned and bought for in the few minutes between train, afterschool pick up and home. Not having a car means I can’t go to Tesco’s 12 miles away if our edge of town Asda doesn’t have ‘it’. If I want something not obtainable in our town it has to be worth ordering online or carrying from Edinburgh. On a good day this reduces our food waste, prevents us from buying things we don’t *really* need and insulates us from the ‘pester power’ emanating from our 6 year old. On a bad day it means I wander around the Co-op unable to think of a single thing to cook, having already used up all my brain power during the working day. It has been a revelation in recent years to find out how much parental time is dedicated to the transportation of children, not just to school but to afterschool activities – ballet, horse riding, Cubs, gymnastics, swimming, judo; an actual endless list if you have the resources. Thankfully both my husband and I subscribe to the can’t be arsed parenting theory and we’ve limited our son’s programme to two classes a week that we can walk or cycle to, preferring to encourage free play with friends. 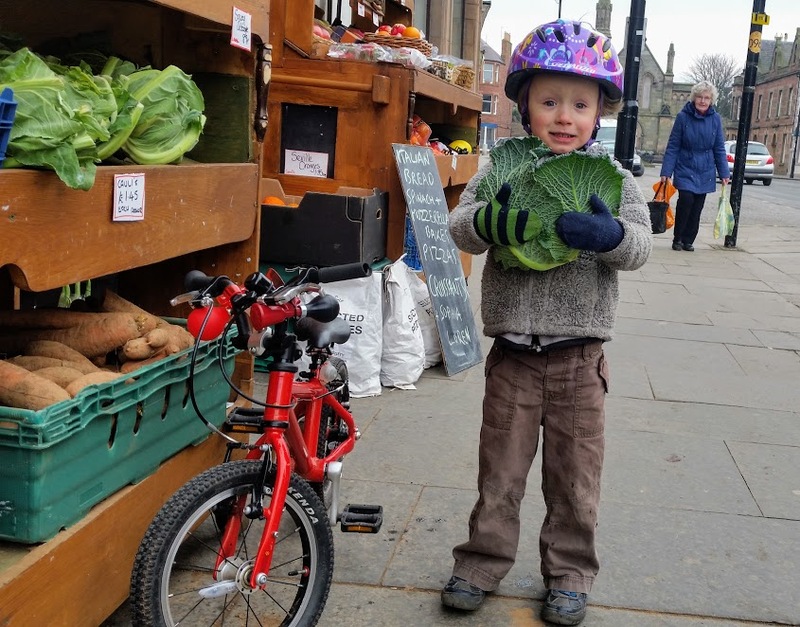 He might be missing valuable horse riding experiences, but our High Street location enables our son to go to our closest shop and buy milk (or cabbages..) without crossing a road. Judging by the screams of delight from a gaggle of friends staying over recently, it’s not something many six-year-olds are able to do and is an adventure of its own. We are within easy cycling distance of school, the sports centre, swimming pool and community centre so I’m looking forward to years of not being an unpaid taxi service whilst our out-of-town friends continually ferry their offspring around. We have quite a lot of middle-class privilege going on in our household, with our four degrees and management jobs we decide what our schedules look like. We aren’t tied to desks at a particular time, although the flipside of this flexibility means that you’ll often find us both working at different tables in the evening or in different cities. What it also means is that we can work around the ‘rural’ train service from our part of the world, reaching Edinburgh about 45 minutes after school drop off, rather than joining the queue of cars on the Edinburgh Bypass each morning. In theory I work from home, reducing unnecessary travel, but in practice this is usually ‘working from train’. Some mornings I stand at Edinburgh Waverley looking at the two tides of people struggling past each other to get on/off the Glasgow train and wonder if people are going to vital meetings, or just to sit at desks in another city. The ‘Beast from the East‘ should have provided an opportunity for us to reflect on our need to travel, with the (then) Transport Minister asking almost everyone in Scotland individually if their journey was essential. The question really is ‘essential for who’? For your boss to keep an eye on you, or for you to carry out your work? I appreciate that many jobs need you be there – heart surgeons really need to show up, but for keyboard warriors like me the Beast had negligible impact on my productivity once our child was occupied and I stopped looking out of the window. A real excuse for n + 1? As its ‘challenging’ to use on hills, and has something fundamentally wrong with the breaking mechanism, it’s had limited use this year and has been mainly clogging up the shed. Car Forup wasn’t an expensive car to run, with about £50 tax and insurance going out each month and no significant bills that we can remember. But he didn’t run very often, so as a sedentary extension to our storage capacity (he was mainly used by me to leave things in) he wasn’t providing good value. Four years ago, on the eve of my son’s second birthday, I started this blog to document my crash landing into parenthood and thank those who helped me survive the impact. Our tiny premature baby has grown and thrived and, although cycling isn’t everything*, he learned to pedal just after his third birthday, cycle toured the Netherlands before he was four and was mansplaining adequate breaking technique to me at five. He has distributed hundreds of Pedal on Parliament leaflets, handed #walkcyclevote postcards over the least receptive looking people in two elections campaigns and been my inspiration to keep campaigning when it felt like we were getting nowhere. Want to get me raging? Just tell me about a great initiative that makes children more active but don’t follow it up with a comment about the most sensible and sustainable method of enabling everyone to meet physical activity guidelines. We design our towns and cities so many children need to be transported by car – to school, to friends and after-school activities – rather than enable independent mobility and then wonder why our children are inactive, obese and unhappy. In the Netherlands they aren’t content with enabling their offspring to gad around on bikes like it’s normal, they even built their communities to prioritise play. Thankfully there are now some people linking active travel and childhood freedom in the UK, supporting the re-prioritisation of our streets towards what we all really value – our families. Temporary street play initiatives are helping communities see that car dominance is having a detrimental effect – on children, health and air quality – and that another vision for our communities is possible, one where everyone, particularly children, can thrive. ‘Share nicely’ must be one of the most overused phrases in early parenthood, but it’s at least one that my son paid attention to and he’s now an excellent sharer as long as he doesn’t want whatever it is that much. When it comes to road space I’m really not into the sharing thing so much myself anymore. I realised in early pregnancy that soft bodies and large metal objects don’t mix well and stopped cycling. You can ‘encourage’ mutual respect, ‘educate’ drivers until they can recite the Highway Code and dress every child in Scotland in flashing high-visibility vests but none of that will prevent a ‘momentary lapse of concentration‘ which seems to affect drivers on a daily basis. Let’s have segregated cycling infrastructure networks in our towns and cities – as well as keeping us safely away from motorised traffic, it would enable modal shift, create places that people want to be, reduce air pollution and mean we can all eat more cake. Share the road? Hmm.. let me think – no thanks! I’ve told my son that no-one likes a moaner, so I’m just offering some friendly feedback here to the designers of cycle paths based on our ‘user experience’ of this NCN route in East Lothian where we live. Sometimes ‘useable’ but imperfect is acceptable, but if a five year old is making judgy comments about your infrastructure then you have seriously under performed. Excellent is possible and we’re seeing more local authorities take the plunge and start to design streets for people in towns and cities across Scotland. Often city schemes get the attention, but I’d like to give a high-five to whoever worked this magic in one of Scotland’s smallest local authority areas, Clackmannanshire, enabling us to cycle for miles on safe, separated paths, discovering a corner of our own country we’d never seen before. Can success be measured by smileage? A number of highly respected cycle campaigners carry measuring apparatus with them to assess by how much our cycling infrastructure fails to meet the mark. This is great as it gives something objective to work with, but the only question that matters to me is simply ‘is this safe for my child?’. If our planners brought their own children to work we might start to get what the Dutch and Danish have already, because until we have infrastructure that most parents feel safe using with their children we won’t see the modal shift our Governments want. Yes, we’ve learnt a lot over the last four years, not least that we need to stop campaigning for ‘cycling’ and engage people in a conversation about where they want to live, work, bring up families and grow old. When we start to talk about what we want we can perhaps stop building communities in a way that deliver what we don’t want – congestion, air pollution and inactivity. 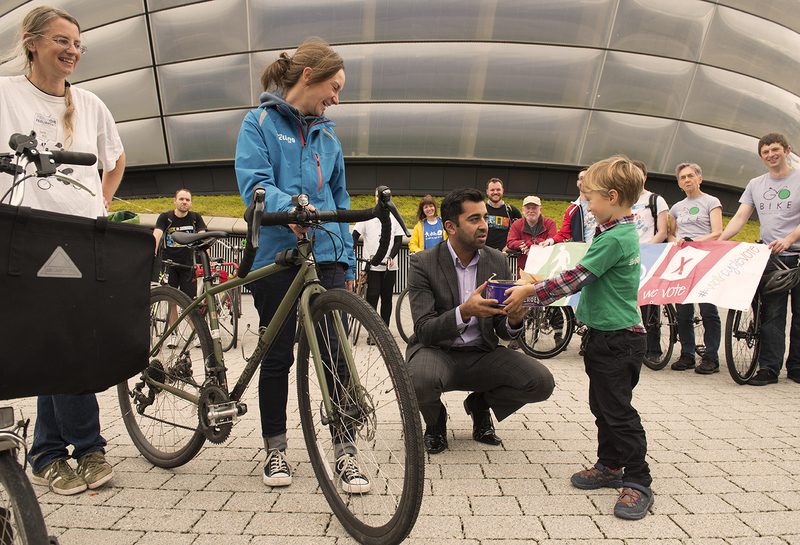 With the new investment in active travel I have hope that my son’s cycle campaigning career will be short, and that his children will be able to walk and cycle safely whenever and wherever they choose – because we decided to really make Scotland the best place to grow up and put our families first. *Cycling is everything, but my husband looks at me strangely when I say it out loud. Please note, this is my impression of Lisbon from an afternoon of attempting to cycle (and from discussions with local campaigners) not a comprehensive study tour! I enjoy cycling in cities and have taken to two wheels in Mumbai and Panama City in the past and New York, London and Rome more recently so I was keen to try the streets of Lisbon at the end of our summer holiday in Portugal. Me: Look, there’s someone on a bike! It’s another Brompton! Like many cities in the throes of summer, the streets were packed with tourists wandering aimlessly, disregarding all attempts to keep them on the pavements, and disgruntled locals trying to get on with their lives. Some car users had obviously done the Roman driving test and were putting their new parking technique into action by leaving their motors double parked, blocking entire streets. Lisbon streets felt quite hazardous, with the tram tracks snaking their way across the city, accompanied by hills steep enough to push my thighs and rental bike to their respective limits. These obstacles were compounded for me by the one way streets so I seemed unable to avoid them, leaving me wheeling my bike more than riding it. My friends Tito and Patricia rescued me from endlessly cycling around the pedestrianised Praca do Comercio by taking me to try out one of the few pieces of cycling infrastructure in Lisbon, a lovely green path perhaps a couple of miles long. Splendid. Unfortunately it suffers from the issues that plague cycling infrastructure across the world – it’s not part of a network and it doesn’t go where people want to travel. After our enjoyable, if short, ride to the end of the path, we hauled our bikes over the railway bridge to try the path by the water, which links up to this usable but shared use confusion zone. Pedestrians, bikes, cafes crowded with people drinking alcohol in the sunshine adjacent to the sea. What could go wrong? After putting my hill climbing and tram track dodging capabilities to the test, Patricia and Tito handed me over to Ana, a cycle campaigner who runs a cycling social enterprise in the city. We found that advocacy in both our countries has some distinctive similarities – volunteer run, under resourced and over stretched – but the barriers to progress were different, possibly reflecting the cultural and political situations as well as the personalities involved. I tagged along with Ana to a meeting arranged with Pedro, the R&D lead for a Portuguese cycling company that had been involved in developing the new ebike for the Lisbon bike share scheme. The bike was on display at the World Bike Tour, and I felt distinctly A-list as we cycled past security and into the exhibition area. The bike share promises to be cheap, with the electric assist helping on those thigh-testing hills. The prototype even had a phone holder to keep an eye on Twitter ensure you can keep your city map right in front of you as you ride. Lisbon has many attractions – fantastic architecture, excellent food, good weather and easy access to lovely beaches – but superb conditions for cycling is not one of them yet, and is unlikely to be for some time. However, it is evident there is a latent demand for cycling – the cycling businesses look like they are booming and there were more than a handful of fully kitted out roadies and mountain bikers, as well as tourists and locals weaving between the pedestrians on the pavements. Looking at the Lisbon streets now it’s hard to imagine many parents choosing cycling as a convenient and safe transport option in the near future. But perhaps people used to say that about car choked Amsterdam forty years ago. I’ve always loved sleep. Call me Cinderella but even as a student I loved to be tucked up in my bed well before midnight with a good eight hours of shut-eye ahead of me. Then I had a baby that didn’t sleep. That baby turned into a toddler that didn’t sleep much, who then eventually turned into a four-year old that slept in our bed and Kicked. Me. All. Night. Sleep became something I would dream about, if only I could be asleep long enough to dream. So the thought of ever doing the Edinburgh Night Ride seemed farcical; why would I voluntarily torture my sleep deprived self, and try to cycle the furthest distance I’ve done since childbirth into the bargain? Two factors converged this year to make me book myself a place and get my tired legs in training – our son was evicted from our bed (and we all started sleeping for more than four consecutive hours) and the legendary ultra endurance cyclist Mike Hall was killed during the inaugural Indian Pacific Wheel Race. I never met Mike, but like thousands of others I’d been touched by his passion for cycling and the way he inspired people to be the riders they dreamed they could be. From all accounts, he was a kind and generous man into the bargain, making the tragedy of his unnecessary and early death harder to bear. When the call came to #BeMoreMike – to be brave, to challenge yourself, to say yes – it was clear what I should do. Despite my concerns I knew I was in safe hands because the Edinburgh Night Ride is organised by a cake loving, map reading, super planner with help from an elite squad of scone connoisseurs. In addition it’s semi-supported by Leith Cycles and the riders are divided into small groups led by a crack team of cycle ride leaders that ensure you aren’t left cycling by yourself in rural yokel land in the middle of the night. You might feel exhausted and desperate for sleep, but you won’t be alone. The ride itself was on familiar territory, starting close to where I’d lived in Edinburgh to within a few miles of the town I now call home with my family, before back to the city for breakfast. Yet as I pedaled the familiarity grew less as we travelled along roads I’d never seen and in mid summer darkness that I’d not seen on purpose for some years. The miles slid by easily, with some help coming from chat with friends and a restorative cake selection alongside the soup at Loft Cafe and Bakery in Haddington. My only discomfort was in my eyes, with contact lenses complaining bitterly that they really shouldn’t be out and about at this time in the morning and what the hell was I playing at? The hours followed the miles and sunrise took me by surprise by happening as I drank the Loft dry of tea. It was light as we left at around 4am and the well-past-midnight-snack did its job by convincing my tired eyes and legs that it was a sensible time to up and start the day, without having gone to bed yet. Just after 6am I was taking celebratory photos of my bike at Portobello Prom and at 7am I was face down into my first of about 500 cups of returner tea, tweeting to the world that I had survived. For many people this wasn’t an epic, it was an average length ride at a peculiar time of day. But for me it was another turning point in my life as a cyclist, now a slightly braver one that’s looking to embrace a few more challenges and say yes, this woman can.